With convenient features like a see-through cover so you know exactly when to empty the extra large basket, the Super II™ Pump by Hayward is built to last and engineered to perform even under the most demanding conditions. This high-performance pump also features full-flow hydraulics that allow greater flow at a lower cost of operation and a housing design that makes is as quiet as it is dependable. Self-priming and a 155 cubic inch basket for extra-leaf holding capacity, the Super II™ simply out-performs the competition. • Full-flow hydraulics allow greater flow at a lower cost of operation. 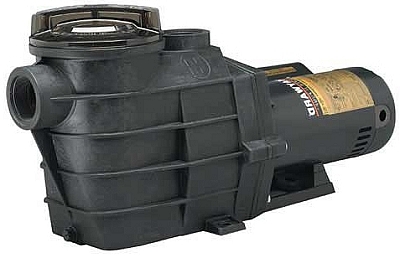 • Heavy-duty, high performance motor with airflow ventilation for quieter, cooler operation. • See-through cover so pool owners know exactly when to empty the extra-large debris basket. • 155 cubic-inch basket has rigid construction including load-extender ribbing for free-flowing operation. • Uni-bracket mounting base provides stable, stress-free support, plus versatility for any installation requirement. Adapts 48- and 56-frame motors. • Self-priming (suction lift up to 8' above water level). • Includes pump lid removal tool. Reward Points 880 points will be rewarded to you when you buy this item.